Search.searchismt.com is the PUP that uses misleading techniques to prevent removal. Use Reimage to locate malicious components and get rid of them faster than with uninstall instructions. A full system scan blocks virus reappearance and prevents traffic to malicious domains. 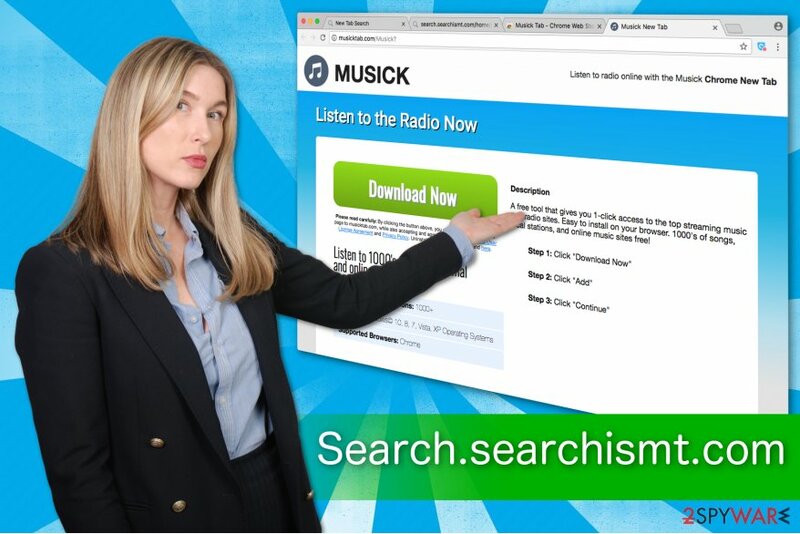 Searchismt functions as a fraudulent search engine which spreads as the Musicktab extension on Chrome Web Store. It is described as a free tool which requires only one click to access top music and radio streaming sites. In reality, it takes over user's browser and starts performing its potentially dangerous activity. As most of the other browser hijackers, like Home.musicktab.com, Search.searchqpt.com, Search.searchumrz.com, this unreliable software spreads with the help of bundling technique. Once it settles on the system, it changes your browser's settings to become the primary search provider. This way, once you click on your homepage, new tab, or open the browser, you will be redirected to hxxp://search.searchismt.com/. Don't be fooled by the thought that such modifications are insignificant. Have in mind that Searchismt does so to generate revenue by pay-per-click marketing scheme. In other terms, you will be provided with the query results which are beneficial for the developers of this unreliable software rather than you. This is a popular way to lead users to the affiliated websites. Note that after Search.searchismt.com hijack, you will often encounter advertising content online which is typically useless and expensive. However, be aware that delivered ads by this potentially unwanted program can not only be deceptive, but dangerous as well. 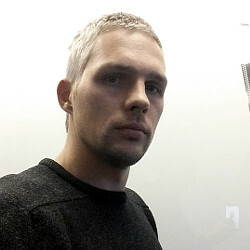 Since the developers, Polarity Technologies Ltd., claim that they do not take responsibility for the products/software promoted in the advertisements, people can be easily redirected to shady websites where criminals aim to distribute high-risk computer infections. Thus, if you keep Searchismt hijacker on your PC, you risk your system's security. 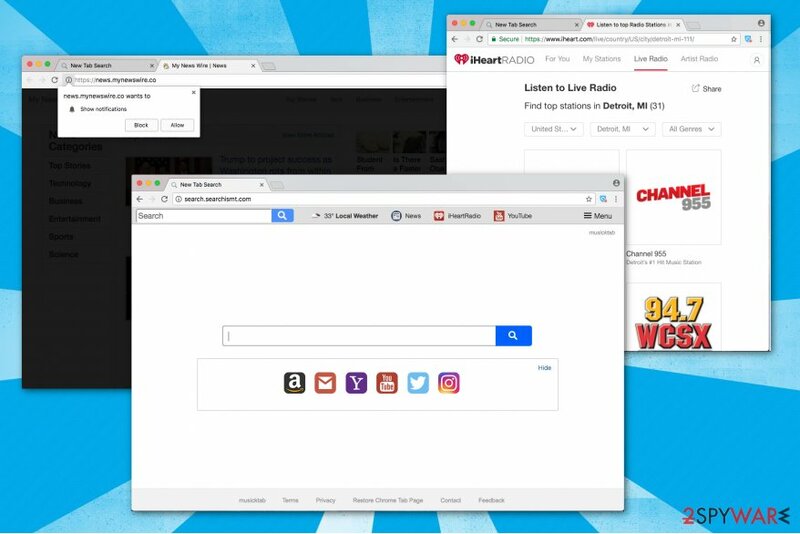 Search.searchismt.com is a browser hijacker which spreads as Musicktab on Chrome Web Store. If that is not enough, Search.searchismt.com redirect is not the only problem which its victims will encounter. This fraudulent search engine collects numerous information about its users. Even though such details are categorized as personally non-identifiable, you can unconsciously give in your credentials when you submit search queries. In spite of all the above-mentioned reasons, we strongly suggest you remove Search.searchismt.com as soon as possible. If you want to get rid of the browser hijacker quickly, use Reimage or any other reliable security software to scan your computer and eliminate all potentially unwanted programs and their components. Keep in mind that delaying Search.searchismt.com removal can put not only your computer's security but your own privacy at risk. Any collected personal details can lead to serious privacy issues or even identity theft in the worst case. Thus, do not hesitate and uninstall this browser hijacker right now. Developers hide their unreliable programs inside the installers of free applications to deceive people into installing them. Such distribution method is called bundling as is widely used across the world. Even though many users are aware of such actions of the contrivers, they continue not to take precautionary measures to avoid browser hijackers. Always use an antivirus and update it regularly. In contrary to Trojan or ransomware infections, you can get rid of Search.searchismt.com using two methods — automatically or manually. However, it doesn't mean that the elimination procedure is easy. You still must be extremely attentive and carefully follow the instructions of the experts. Automatic Search.searchismt.com removal requires you only to download a professional security software and run a full system scan of your computer. The antivirus will do all the job for you. You can find the list of your recommended malware removal tools below. However, if you want to remove Search.searchismt.com manually, LosVirus.es team says you should be prepared to dedicate some time for this procedure. Follow manual elimination guidelines which are attached at the end of this article. Make sure not to avoid any steps if you want to clean your system successfully. Here, look for Search.searchismt.com or any other recently installed suspicious programs. Wait until you see Applications folder and look for Search.searchismt.com or any other suspicious programs on it. Now right click on every of such entries and select Move to Trash. When in the new window, check Delete personal settings and select Reset again to complete Search.searchismt.com removal. Once these steps are finished, Search.searchismt.com should be removed from your Microsoft Edge browser. Here, select Search.searchismt.com and other questionable plugins. Click Remove to delete these entries. Now you will see Reset Firefox to its default state message with Reset Firefox button. Click this button for several times and complete Search.searchismt.com removal. It is important not to forget to uninstall not only Search.searchismt.com, but Musicktab extension as well. Later, restart your browser to bring it to the primary state. Here, select Search.searchismt.com and other malicious plugins and select trash icon to delete these entries. Click Reset to confirm this action and complete Search.searchismt.com removal. Here, select Extensions and look for Search.searchismt.com or other suspicious entries. Click on the Uninstall button to get rid each of them. Here, look at the Homepage field. If it was altered by Search.searchismt.com, remove unwanted link and enter the one that you want to use for your searches. Remember to include the "http://" before typing in the address of the page. Now you will see a detailed dialog window filled with reset options. All of those options are usually checked, but you can specify which of them you want to reset. Click the Reset button to complete Search.searchismt.com removal process. ^ Pay-Per-Click. Wikipedia. Free Encyclopedia. This entry was posted on 2018-01-30 at 08:18 and is filed under Stealing programs, Viruses. You can quickly scan the QR code with your mobile device and have Search.searchismt.com manual removal instructions right in your pocket. How did you remove Search.searchismt.com?